Since Alan is a realtor, he knows the value of great Vancouver views and location, location, location. He and his wife Pamela wanted a cozy and stylish place with all the amenities that is well suited to entertain guests. (And Simba their cat just wanted to ensure we didn’t encroach on his sun bathing spot.) In short, they wanted it all. And why shouldn’t they? Once they chose the perfect Beach Ave space, they focused on the renovation. The folks at Synthesis Design created beautiful plans, Edgewood Construction took care of transforming the space, and we handled the home tech design and implementation. The kitchen and living room forms the hub of the home. Here they wanted their favourite music in the air while they entertained guests in their gourmet kitchen. They also wanted an immersive media room when it was time to curl up to watch golf or Netflix. We worked closely with the team to create a custom fireplace design that incorporates a fantastic Panasonic plasma TV and tailored-to-match Triad speaker bar that is part of the 5.1 surround sound experience. 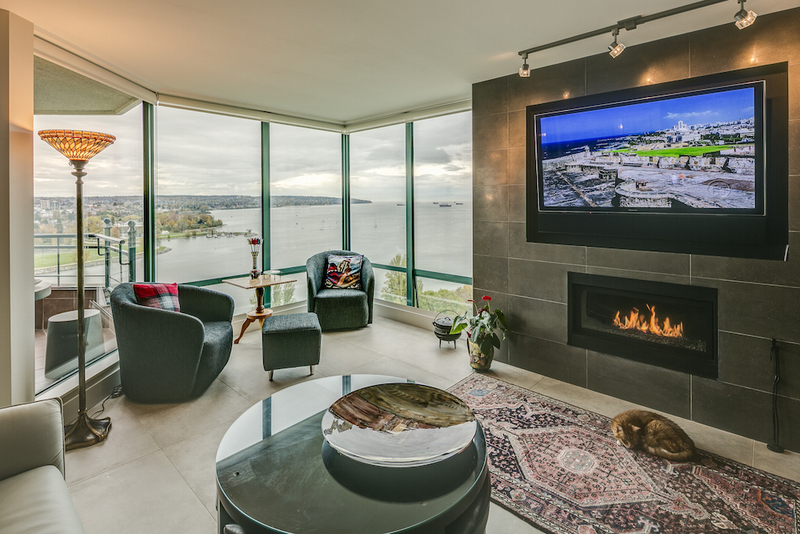 The rest of the equipment is out of sight to keep the focus on the beautiful living space and stellar views of English Bay. 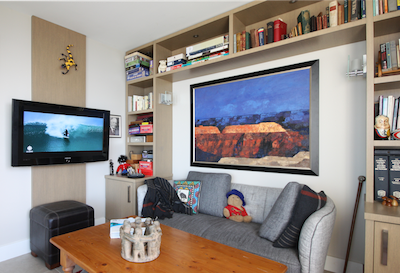 Media spaces were also integrated into the cosy den and luxury master bedroom to allow for flexibility. For these rooms, existing TVs were freshened up with new equipment. As a backbone of the system, we implemented a wired and Wi-Fi network that can keep up with everything from work tasks to Alan’s endless DJ’ing on Spotify. We focused on creating solutions that not only matched their needs and lifestyle but also didn’t detract from their style and living space. Home technology is increasingly important in homes, but it doesn’t have to dominate rooms. This home is a great example of where you can have immersive home tech solutions while maintaining the feel of the living space. Alan and Pamela deserve to have it all, and we hope they enjoy it. This entry was posted in Home Tech Case Study and tagged custom install, home tech, media room. Bookmark the permalink.